If you asked us to design our ideal Android phone, it might well end up looking like LG's Optimus Black. The handset that was once known under the codename "B" features a clean, elegant and exceedingly thin exterior, which is garnished with a 4-inch IPS display capable of generating 700 nits of brightness. There's the usual litany of added features, too, like a 5 megapixel shooter with the ability to record 720p video, a special G-Key for motion controls, and Wi-Fi Direct for peer-to-peer file transfers. Of course, looks and headline features are just the tip of the iceberg that is user experience, so if you want to know about the mountainous whole, join us after the break for a deep dive with LG's latest Android phone. How would you rate the Optimus Black? The Optimus Black's external design is all about minimalism. The most basic manifestation of this pursuit is in the phone's extremely frugal weight (109 grams / 3.8 ounces) and thickness (9.2mm / 0.36 inches). Aside from striving to occupy the smallest physical footprint, however, the Black aims to convey a sense of understated sophistication. That means no perfunctory detailing on the front -- a single glass sheet covers almost the entire visage, breaking up for only a millimeter at the very top to allow for the earpiece. Beneath it, proximity and light sensors have intentionally been made nearly invisible to the human eye as has LG's own logo, which is painted on in the darkest of greys, leaving only the front-facing camera as a recognizable feature in the bezel above the 4-inch screen. The Android buttons at the other end also flirt with evanescence when not in action, but are highlighted by a versatile backlight when called upon. There's a full illumination mode that bathes the keys in white light immediately after you unlock the phone or press one of them, with a blue glow identifying the pressed button for a second or so. A secondary, more subtle, lighting setting kicks in while using other functions of the handset, which achieves its dual purpose of being simultaneously unintrusive and informative. We've seen our fair share of Android button backlights either leaking or failing to turn on when they should, so the perfect execution by LG on the Optimus Black is worthy of commendation. Once you get past the tidy front end, you'll find a whole heap of nothing on the left and bottom sides of the Black, with a couple of trapezoid shapes serving as volume rocker and G-Key (more on that below) on the right, and your usual headphone jack, power / lock combo button, and MicroUSB port at the top. 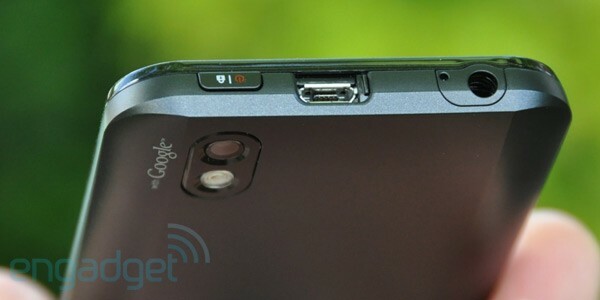 Placing the data transfer and charging input atop the phone is atypical but not detrimental to usability. It comes with a sliding port cover the likes of which you might have previously seen on phones like the Omnia 7. Not that LG is copying Samsung, we're sure those guys never look over each other's shoulder. The back is graced only by a 5 megapixel camera -- whose lens and LED flash have been wisely recessed a little to protect against scuffs and scratches -- some LG and Google branding, and a mesh output for the single loudspeaker. Gentle downward slopes on the left, right and bottom of the Optimus Black give it a hand-friendly curvature. LG has decided to dub this the C-Curve, though it reminds us most strongly of Microsoft's Zune HD. Our only issue with this design is that the slopes don't actually extend all the way to the front of the phone, resulting in your hand gripping an angular construct that just happens to have curvy parts as well. Admittedly plumper handsets like HTC's Incredible S and Motorola's Atrix offer more comfortable grips at the same 4-inch screen size, and if you're happy with a larger smartphone, we'd point you in the direction of Samsung's Galaxy S II, which marries a 4.3-inch display with some very agreeable ergonomics and thinness on a par with the Optimus Black. LG has opted to make the plastic cover on the back of the Optimus Black envelop its sides as well, making it a rather crucial element of the overall design. On the one hand, we're happy to see that even with such an aggressively thin design, the manufacturer has managed to still allow you access to the battery compartment, but on the other, we're left somewhat unconvinced by the durability of the casing used. It feels brittle and isn't anywhere near as flexible as the functionally similar one on the Incredible S. We're left with the gnawing suspicion that the Optimus Black will be more susceptible to cracks and bruises over the long run than its competition. Other than being thin and light enough to make other Android phones renew their electric gym membership, the Optimus Black's inarguable highlight feature is its so-called Nova Display. That's a fancy way of saying it has an IPS screen of the quality (and resolution, 800 x 480) found on the Optimus 2X / G2x with brightness capabilities extended all the way up to 700 nits. As far as the quality of output goes, we again find ourselves eyeing an IPS panel that seems halfway between LCD mediocrity and true IPS excellence as exhibited by Apple's iPhone and iPad. Clearly, this has been a cost-cutting measure on the part of LG, the result of which is a display that offers better color reproduction and viewing angles than the vast majority of LCDs but sits a a clear step below the finest available today. Of course, LG's big counterargument would be to say that as exceedingly awesome as an iPhone 4 or a Samsung Galaxy S II may be to look at indoors, it doesn't do you much good if you can't see it when out in the sun. That is, indeed, where the Optimus Black shines. Cranking up its screen brightness to the maximum, we found the composition and playback of photos and video almost entirely unaffected by the direct sunlight we were bathed in, which was quite the feat. As far as outdoor readability goes, the Optimus Black is among the very best we've tested so far, which combines with its above average general performance to make this handset's display its most valuable asset. A warning is merited about the Black's auto-brightness, however, which hunts around a lot and is a little too sensitive -- merely passing a finger above the phone's ambient light sensor was enough to trigger a lowering of brightness, which happens in discrete, abrupt intervals. We'd advise controlling this setting yourself and giving the eccentric light show a miss. LG has gone the extra mile with the 1500mAh battery inside the Optimus Black: it's been slimmed down and elongated specifically so it can fit within the phone's more stringent dimensions. That's a fine engineering accomplishment, however even with that much juice the Optimus Black's longevity disappointed us. And rather gravely at that. Having used the phone over the length of a full week (a rare luxury for us), we consistently managed to run the battery down to 20-something percent within 12 hours of unplugging the Black from its charger. Considering that a lot of that time was spent merely collecting updates from Twitter and Gmail and doing some sporadic web browsing and music listening, that's an unimpressive number. Once we heightened the workload with the performance of our camera tests and a few phone calls, we were able to deplete the battery to just four percent within seven hours. Again, we weren't shooting 720p video for the full seven hours, we just did more processor-intensive tasks during that test, though nothing that can be considered extraordinary or unrepresentative of real world use. From our experience, we feel confident in saying the Optimus Black will last you a full day at the office, but you'll have to charge it right up until you leave in the morning and plug it straight back in as soon as you get home in the evening. Given the Incredible S' ability to keep on ticking well into a second day after being fully charged, we consider the Optimus Black a clear step behind when it comes to battery life. Pumping tunes out of this LG handset's one speaker isn't going to rank highly on its list of regular duties, but the good news is that the sound produced is crisp and clear. Maximum volume's a little on the low side, forcing us to go all the way to 11 the top setting when playing back media, however that still provided a very comfortable listening experience -- contrary to other phones whose highest volume is reserved for tinny and distorted output. We reckon LG has exhibited a good bit of restraint by working within the phone's limitations here. On the other hand, the earpiece gave us more serious cause for concern. Phone calls oftentimes degenerated to the point of making the other party sound robotic, which was in equal measure the fault of the audio and antenna hardware inside the Optimus Black. Using our regular SIM at our regular testing spot, we found the phone completely lost audio (no dropped calls, mind you) on multiple occasions, whereas even things as simple as a ringing tone were also affected by the above robotic-sounding quality. We understand tradeoffs are inevitable when building a phone as slick and slim as the Black, but this isn't a good one. It's particularly disappointing to see LG neglect call quality in light of the company's previous excellence in this field, as exhibited by such devices as the BL40. On a sunnier note, the Optimus Black's photography skills are way above average. It doesn't feature the same mighty 8 megapixel sensor as contained within the 2X / G2x, but its 5 megapixel imager did some stellar work for us all the same. Detail is picked up and lovingly retained all over photos, while noise and blurryness are at a serious deficit. 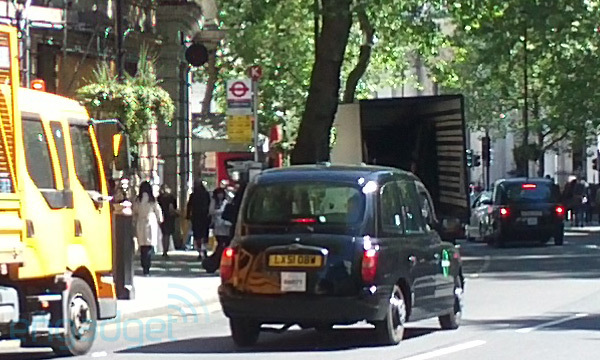 The above snapshot is a 100 percent crop of this picture, and if you're not impressed yet, we might as well tell you that both the taxi and the lorry were in motion at the time of shooting. Performance is great whether you're taking distant shots or going in for a closeup, and when shrunken down to about a megapixel's size, the Optimus Black's images stand a good chance of convincing you they were taken with a dedicated camera. There are a couple of slight issues with color reproduction -- it's not always wholly faithful to the subject matter -- and contrast not being strong enough on a few pictures, but those are easy to either correct or ignore. The important thing about the images captured by the Optimus Black is that they're detailed, and a quick rinse through your favorite image-enhancing program will make them look their best. A highly detailed options and modes menu will also help any budding photogs who desire the thinnest and lightest tool for their trade. Video capture was highly satisfactory, however the .3gp files outputted from the phone were weirdly stretched when we offloaded them onto our computer. You can see them reproduced below, entirely unreformatted. Playing them back on the phone itself was a gorgeous, perfectly smooth experience -- notable given we recorded at 720p -- and you should still be able to get a good idea of the quality of the results below, in spite of the funky aspect ratio. If there's one thing professional sports have taught us, it's that speed kills. The Samsung Galaxy S II and LG's own G2x have recently raised the bar when it comes to responsiveness among Android smartphones, which is an unfortunate development for the Optimus Black as it's a handset that can't be considered fast even by yesteryear's standards. The single-core 1GHz chip at its heart may be sucking down a lot of power, but its output was meager by modern standards and benchmarks. In Quadrant, we typically got between 1,100 and 1,300, Linpack gave us 12.5 MFLOPS on average, Nenamark exhibited some noticeable stuttering on its way to a 26fps result, and Neocore couldn't crack past the 50fps mark, hovering in the mid-40s. Admittedly, Neocore is a benchmark that's explicitly designed for Adreno graphics chips, but the age of all these tests is such that a current-gen smartphone should be chewing through them with ease. The Optimus Black failed to do so, but more importantly, the subdued synthetic test results were matched by unimpressive speed in real world use. Animations when transitioning between homescreens in the LG Optimus UI are choppy. With the Optimus Black, lag won't be as much of an annoyance as the simple dropping of frames when performing onscreen actions. Even the initial act of unlocking the phone isn't as fluid as we've seen on other devices and the pervasive feeling you get is that the phone's struggling (or straggling) while performing your commands. This behavior carries over to the web browser, which loads pages quickly and doesn't exhibit any formatting flaws, but also labors under the strain of scrolling and pinch-to-zoom instructions. It's important to say that nothing is broken about them, everything works, but the Optimus Black doesn't have the same air of effortlessness in these tasks as other phones of this generation. Moreover, the phone's capable of playing back Flash content within the browser, but cannot offer smooth playback of 480p videos. Ultimately, the consistently sluggish performance put us off using the Optimus Black and we imagine others too would be disappointed not to see its looks matched by its deeds. We were also underwhelmed to find the Black shipping with Android 2.2 on board instead of the latest version 2.3, but at least LG looks to have learned from its mistakes with the Optimus 2X and is sending a very stable software build out with its latest phone. None of the repetitious crashes or aberrances we encountered with the 2X were present here, leaving the only major complaint about the software as the fact that LG failed to meet its hardware requirements with what's inside the Optimus Black. A Gingebread (2.3) update is naturally promised to be in the works, but we always advise to buy a phone on the basis of what it brings in the retail box rather than the potential of what it could be down the line. If you've been following AT&T and T-Mobile's recent exercises in specious branding, you'll know that adding extra Gs to your phone is the latest in smartphone fashion. LG hasn't escaped this trend, though its G addition is the new Gesture Key, which resides just under the volume rocker. When depressed, this button harnesses the Optimus Black's accelerometer to gauge the meaning of your mad waving of the handset and react appropriately. You can hold down the G-Key to navigate between homescreens by simply turning the phone (yes, very much like Samsung's implementation in the Galaxy S II) or alternatively shake the Black twice to enter the camera app. The biggest attraction from our perspective was the promise that pressing the G-Key and picking up the phone the way we naturally would for a call would automatically answer an incoming call, but alas, we struggled to make it work. In fact, we've yet to figure out what's wrong with our double-shaking (should we be saying "abracadabra?") and don't know whether the promised camera app activation even works. Basically, it's an unwieldy set of motion controls that forces us into the most obvious of puns: the G in G-Key stands for "gimmick." 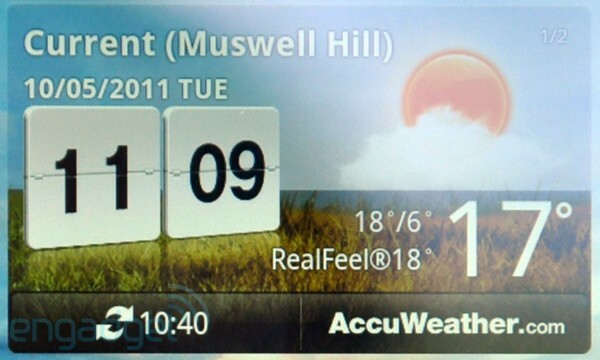 Another chink in the Optimus Black's already dented software armor relates to its touchscreen. There's a chronic failure to recognize taps. Perhaps one out of every dozen inputs we impart to the phone is never registered, which is far too high an error rate for a pleasurable user experience. As a result, we couldn't type with any great speed on the Black, having to perpetually check that it recorded what we'd written. This wasn't particularly helped by the slight lag between punching in words and having them show up on the screen. Wi-Fi Direct was a big deal for LG at CES 2011, where we saw this very handset showing off how easily and quickly wireless transfers can be carried out between compatible devices. The novelty of the approach is that no wireless access point is required to act as an intermediary between Wi-Fi Direct phones, laptops, or watermelon coolers, meaning that you can use your WiFi radio to throw stuff around as simply as you would with a Bluetooth connection. Importantly, with Wi-Fi Direct you can actually communicate with up to eight devices at a time, so caring and sharing in groups can be done pretty effortlessly. The only shortcoming we found to its implementation in the Optimus Black was that we couldn't track down the Wi-Fi Cast app you see in the demo above, which rendered our Wi-Fi Direct connection useless -- there's a ton of file sharing apps on the Android Market for working over a standard wireless network, but nothing that we could find for negotiating Wi-Fi Direct transfers. That said, we were lucky enough to still have a Galaxy S II, another Wi-Fi Direct-capable handset, hanging around our test chambers, so we hooked that up to the Optimus Black to see how well it all worked. Happily, we can report connections were almost instantaneous, with both phones capable of acting as the host. So the technology is there and it's very well executed, but the software was oddly missing. We shouldn't neglect to mention some of LG's helpful tweaks to the Android UI. The lockscreen updates itself with your missed messages or calls and allows you (again, much like Samsung's GSII) to unlock the phone straight into the relevant section. The standard unlocking gesture is an upward swipe, whereas unlocking to a missed call is done with a downward flick, making the two simple to distinguish and precluding the chance of erroneously ending up in a place you didn't want to be. Additionally, when receiving a call, you can slide up a list of message responses, which will reject the call and send out a text message to your caller to soften the blow. On the music front, playback controls have been integrated into the Android slide-down menu -- along with five toggles for sound, WiFi, Bluetooth, GPS and data -- and are also available as a little slider menu on the lockscreen. Both are neatly done and handy to have. The app menu organization isn't the greatest in the world and the contacts list picks up all your Google contacts by default, rather than just the people you've listed in your Contacts section. Neither is much of a hurdle to the enjoyable use of the phone, but a mention's merited all the same. We did appreciate LG allowing the addition of multiple shortcuts and widgets at a time when editing homescreens, which makes customizations much easier and quicker to execute. The Optimus Black feels like a phone that has missed its window of opportunity. Had it been immediately available upon its announcement at CES in January, its omission of Gingerbread may have been considered forgivable, its unimpressive performance would have been less harshly judged in the light of what else was on the market at the time, and its thinness would have actually been a unique feature to promulgate. Now? Now we have phones with qHD resolution, multiple processing cores, and slim profiles to match and even better the Optimus Black. 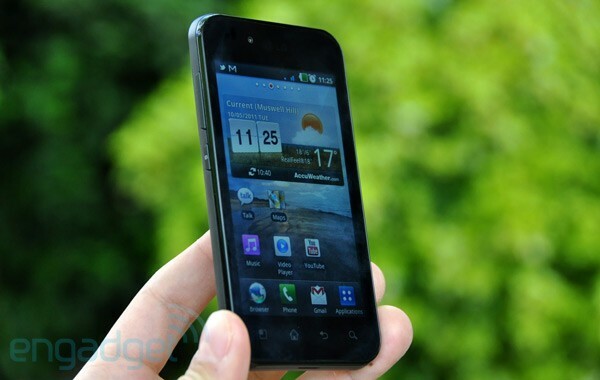 So why would you want to buy the Optimus Black with all the other options crowding the Android smartphone marketplace? Well, we could point to its dashing good looks, quality camera, and above-average screen technology, but if those are your top priorities, you might be better off with a Nokia N8. The one thing keeping the Optimus Black in the conversation is Android and its inherent software and ecosystem strengths, but even that has the stale taste of Froyo in a Gingerbread-eating world. We're sorry, Mr. Black, we really wanted to like you, but you turned out to be as shallow on the inside as you were thin on the outside.